Thanks to the sterling efforts of Monsieur Paul Metadier and his son Bernard-Paul, even those who have never heard of Balzac will enjoy Saché. This delightful, homely, house is almost as the novelist left it after his last visit in 1848. 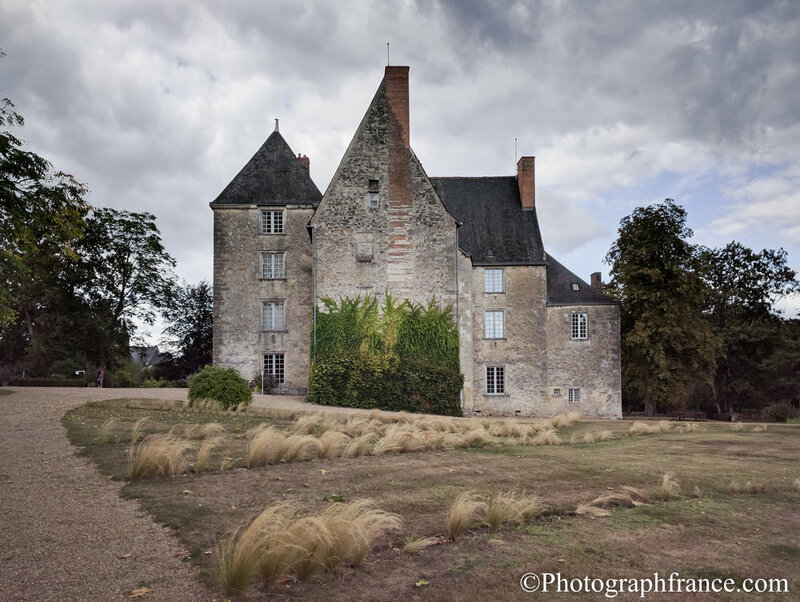 In 1926, Paul Métadier, Professor at the Faculty of Medicine of Tours, bought the nearby Château de Valesne estate (not open to the public) which included the abandoned chateau Saché. 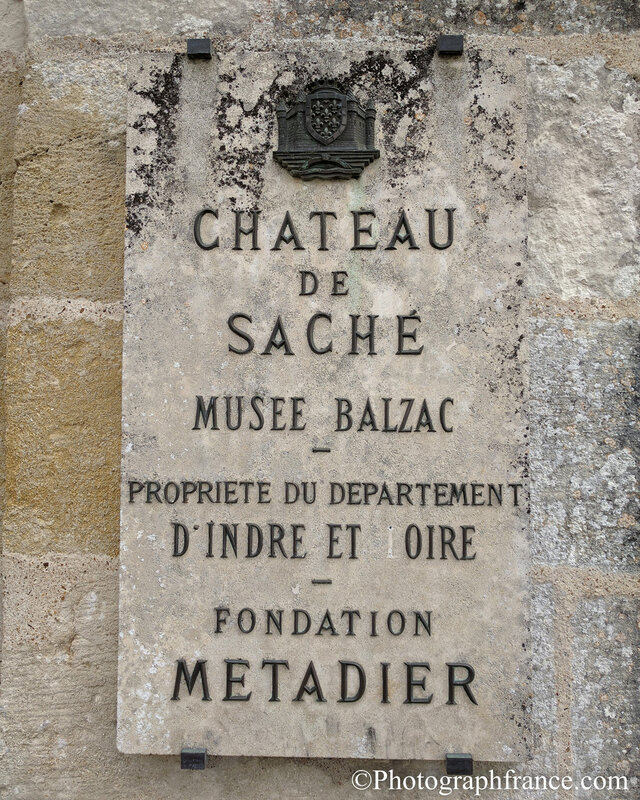 In 1951, Metadier’s son, Bernard-Paul, a devoted fan of Balzac, persuaded his father to turn the house into a museum to pay homage to his hero. Bernard-Paul, who devoted his life to the museum, was the curator here from 1958 to 2001. Balzac’s equally devoted followers, Emile Zola, Marcel Proust, Gustave Flaubert, Charles Dickens (often called the English Balzac) Jack Kerouac, Henry James, Friedrich Engels and Fyodor Dostoevsky would have been delighted. Saché was looted by Germans during WWII but luckily the wonderful trompe-l’oeil wallpaper survived. In the dining room, a fragment of the original wallpaper was used to create its replica. The wonderful frieze appears in Le Père Goriot which Balzac wrote at Saché. The wallpaper in the hall was recreated from a fragment found in George Sand’s bedroom at Nohant in the Indre, where Balzac often visited her. The writers admired each other but did not share political views. It would be a cold heart that did not warm to Honoré Balzac. His life was more tragic than that of the characters in his novels. He is one of those you would love to sit next to at dinner although, as we shall see, that would be difficult. Saché is where Honoré came when life got too much for him, when he needed to go for long walks and breathe fresh county air, where he hid from his creditors in Paris. With a twenty-three hour coach ride to Tours (where he was born) and (if there was no-one to meet him) a fifteen mile walk to Saché when he got off, it was not a journey to be taken lightly. He must have been pretty desperate. There’s no peace living in a château. People come to visit and you have to dress at a particular time. Provincial people think it very odd that anyone should want to miss dinner to pursue an idea. And there you have the words of a non-provincial, a non-conformist, in short a writer. Writers like staying in their pyjamas until at least till lunch time, all day if they can get away with it. They resent spending time away from their desks to wash, clean their teeth, get dressed or go to bed. As for venturing out the reason must be pressing. On his desk at Saché is the pot for the coffee that might have helped kill him at just fifty-one. 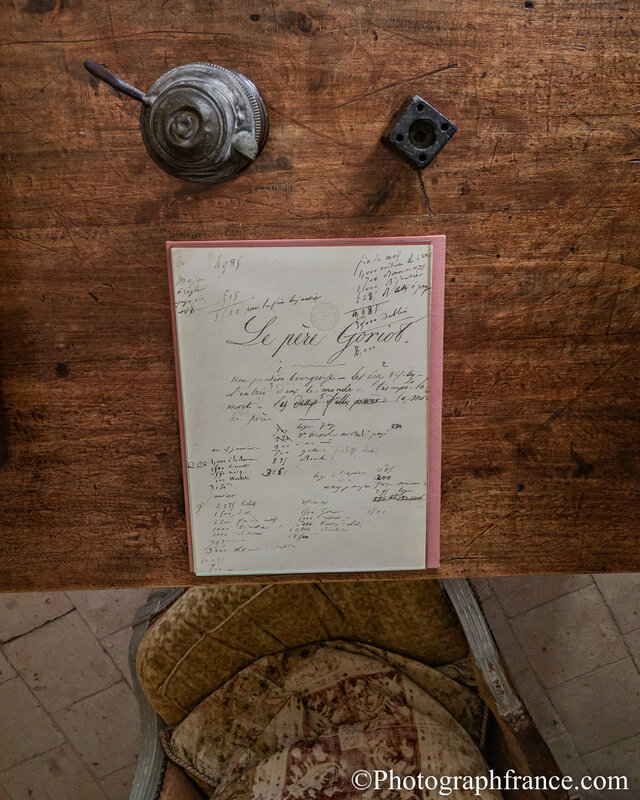 Very particular about his coffee, Balzac had it delivered from Paris and let it brew as he worked from two or three in the morning to five in the evening when the bell, which still hangs at the entrance, called him for dinner. He loved the view from his bedroom window but closed the curtains when he wrote. Writers write to escape from Life, not embrace it. It can provide relief, although in Balzac’s case, it was counter-productive. His obsession resulted in health problems. The aristocracy and authority of talent are more substantial than the aristocracy of names and material power. Of the after dinner entertainment – a deck of cards on the table in the drawing room at Saché – he said: This is how one kills time! Despite annoying hosts wanting to show him off to their other guests, Balzac did manage to write at Saché. By the time he died he had completed ninety-one novels. You can’t do that if you stop for dinner or go to sleep. Talking about dinner, he raved about Saché’s wine cellar, especially the twenty-five year old Vouvray but it’s doubtful he got to drink much. He despised his rich host’s ‘stinginess’ and his ‘intolerant, bigoted, hunchbacked and hardly spiritual’ wife. His hosts were Monsieur and Madame Jean de Margonne, friends of Balzac’s parents which is strange because Jean de Margonne was his mother’s lover. He was the father of Balzac’s half-brother, Henry. Balzac’s relationship with his family was strained. His father, one of eleven children, was aspirational, inspirational. In 1760 he left home for Paris with no money and no support. By 1776 he was Secretary to the King’s Council. After the Reign of Terror he was posted to Tours to coordinate army supplies. Balzac’s mother, who came from a wealthy family, was just eighteen when she married François Balzac. He was fifty. It was not a love match. She didn’t like children either. As soon as Honoré was born she sent him away to a wet nurse, didn’t see him again until he was four and even then kept her distance. At ten he was sent away to school. Although his parents were very well off he was kept short of money and bullied, just one of the many reasons he hated it there and spent most of his time in the naughty corner. Not that he minded. An avid devourer of books, he read till his eyes watered and until the day he became so ill he was removed from school. The hideous wrangling of heirs over corpses not yet cold. He hated being a clerk, a machine, eating and drinking and sleeping at fixed hours…that’s what they call living, that life at the grindstone, doing the same thing over and over again… I am hungry and nothing is offered to appease my appetite. What he really wanted to do was write. His disapproving, furious, parents gave him a starvation allowance to rent the proverbial writer’s garret and starve he did. In the naughty corner again, Balzac felt at home. He considered toil and effort a mark of nobility. When his father died, Balzac, age 30, wrote a story about a 30 year-old man who kills his father. This was the first time he did not use a pseudonym. He signed it Honoré de Balzac adding the aristocratic de in an attempt to fit into respected society. One day Balzac had the inspiration to write La Comédie Humaine (The Human Comedy) a series of books reflecting French society. Considering his own life, La Tragedie Humaine would be more apt. The moment the idea came to him, Balzac raced to tell his sister. He said I am about to become a genius! He did. Edison said genius is one per cent inspiration, ninety-nine perspiration. Balzac nurtured political ambitions. He failed. He said a mediator between the King and insurgents needed a young, vigorous man. Planning to be that man he addressed the upper classes in Chinon. After a near-fatal accident in 1832 when he slipped and cracked his head on the street Balzac decided not to stand for election. In 1836 Balzac became editor of Chronique de Paris, a weekly magazine. The magazine failed. In 1840 he founded Revue Parisienne. It also failed. He tried his hand at publishing French classics but failed. The books were sold as waste paper. He then borrowed money to try his hand at printing. He failed. The wonderful 19th century printing shop in Saché reminds visitors of the trade Balzac practised from 1826 to 1828. It ended in bankruptcy. Balzac wasn’t cut out for business. His genius which lay elsewhere. His spirit was captured by Auguste Rodin in his Monument to Balzac which the visitor will also find in Saché in a room which tells the story of the statue. It caused outrage when it was unveiled in 1891. All Balzac’s early works which were published under pseudonyms are here as are almost all the first editions of his novels alongside his corrected proofs. He revised obsessively, covering proofs with changes and additions to be reset. He repeated this process during publication causing significant expense both for himself and the publisher. In 1832 Balzac received an anonymous letter from the Ukraine with no return address signed L’Étrangère (The Foreigner). It began a fifteen year correspondence between Balzac and Lady Eveline Hańska the object of [his] sweetest dreams. Each had found their soul mate. Lady Eveline was Polish. As a teenager she was married off to an aristocrat twenty years her senior. When her husband died in 1841, overcoming every obstacle put in her way by those who disapproved of Balzac, she married Honoré in 1850. They arrived in Paris on his fifty-first birthday but Balzac tragically died five months after his wedding. Balzac is buried at Père Lachaise Cemetery in Paris. At his funeral, Victor Hugo, who was a pall bearer said the nation was in mourning for a man of genius.